Wendy Pagaduan, founder and creator of Clean Coconut, embarked on a mission to prove that skincare shouldn't be complicated, and us Coloradoans are luckier for it. After suffering for years with eczema and KP (skin bumps), Pagaduan, a retired nurse, realized she wanted a natural remedy without the harsh chemicals found in regular skincare products - and decided to take the matter into her own hands. 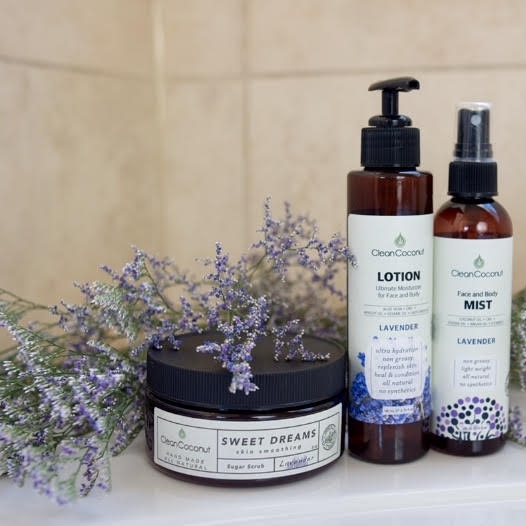 Now in business for over a year, Clean Coconut offers natural, organic skin-loving products made with safe ingredients (i.e. no parabens and fillers) for all skin types. WHat was your inspiration for starting Clean Coconut? My inspiration came from my own personal need to clear up a bad flare up with eczema. This is where I learned about the power of mother nature and what she is capable of curing. I became obsessed with Coconut Oil, CBD Hemp Oil and Essential Oils. So much so, I certified as an aromatherapist in order to get an in-depth knowledge of these ingredients. I am inspired each time I come up with a formulation. I am continually amazed at the therapeutic uses of these ingredients and not only how they nourish the skin but also how they help the mind and body. A caregiver by nature, it makes me feel amazing when customers provide feedback that our products have either helped their skin complaints or relieved their pain or helped someone they bought a product for. It is so rewarding to know that I am helping people with simple, clean, and natural ingredients. I started mixing my products in the kitchen and now have a full manufacturing lab in my basement that includes a mixing station, shipping station & storage area. My first love is my sugar scrubs and body mists, but my recent favorite is our Muscle Rub Lotion. As much as my skincare products have been helping people with sensitive skin. The feedback and response from our muscle rub has been absolutely inspiring, and giving an alternative for people to get relief from aches and pains. As a retired nurse, it touches my heart to provide products that provide targeted relief. Our focus is to infuse Coconut Oil, Colorado CBD Hemp Oil, and Essential Oils into all of our mixed products. Colorado makers are an genuine supportive community. I absolutely enjoy the people, friendships, and relationships that have developed just from being part of local events community. The face and body lotion in grapefruit to keep us moisturized and smellin' good as we transiton from winter to spring! All of our products are handcrafted to perfection by a Retired Registered Nurse in Colorado. We have only been in business a little over a year. All of our product aromas are so amazing you may be tempted to eat them .